Archaeologists from Bulgaria and Poland are planning to start their annual summer excavations of the Ancient Roman military camp and fortress Novae near the Danube town of Svishtov in mid July, 2015. The team of the Veliko Tarnovo Regional Museum of History, which traditionally excavates Novae, has requested BGN 40,000 (app. EUR 20,000) for the excavations, lead archaeologist Prof. Pavlina Vladkova has announced, as cited by local newspaper Yantra Dnes. “We expect that the [Ministry of Culture] will allocate funding for [the excavations of] b. We have requested BGN 40,000, and we hope that they will give us at least BGN 20,000," Vladkova has told Radio Focus Veliko Tarnovo. The excavations of the Roman military camp, which is located near the southernmost point of the Danube River, will last for about a month and a half, until the end of August 2015, she explains. In their exploration of Novae, the archaeologists from the Veliko Tarnovo Regional Museum of History will continue their cooperation with archaeologists from Poland. They will welcome once again Polish archaeologists Dr. Andrzej Biernacki from the Adam Mickiewicz University in Poznan, who has been excavating the early bath of the Roman legionnaires, and Prof. Tadeusz Sarnowski from the University of Warsaw, who has been excavating the commandant’s office of the Roman legion which was stationed at Novae. The finds of the Bulgarian and Polish archaeologists from last year’s excavations of the Roman military camp on the Limes Moesiae, i.e. the frontier area of the Roman Empire on the Lower Danube, will be presented at a scientific conference during the Ancient Heritage Festival “Eagle on the Danube", which will be held in two sections, “History and Archaeology" and “Cultural Tourism", on June 5-7, 2015, in the Danube town of Svishtov. 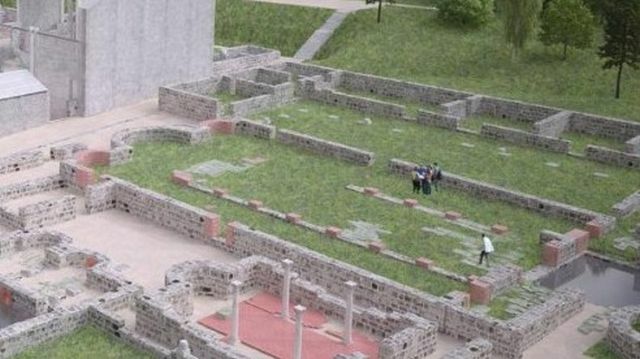 Prof. Vladkova has revealed that the Bulgarian archaeologists working on Novae are expecting to sign a new five-year cooperation agreement with the Adam Mickiewicz University in Poznan for excavations of a previously unexplored part of the Roman city located right next to its bishopric, which has already been restored as part of the cultural tourism project of Svishtov Municipality completed in 2014. The Roman Military Camp and Late Antiquity City of Novae is located 4 km east of the Bulgarian Danube city of Svishtov in an area called Staklen (meaning “made of glass" – because of the Ancient Roman glass fragments on the site). It was a legionary base and a Late Roman city which formed around its canabae, a civilian settlement near a Roman military camp, housing dependents, in the Roman province Moesia Inferior, later Moesia II, set up after the Roman Empire conquered Ancient Thrace south of the Danube in 46 AD. It had a total area of 44 hectares (108 acres), according to a decree of Roman Emperor Vespasian (r. 69-79 AD). Novae is located near the southernmost point of the Danube where in 48 AD the 8th August Legion (Legio VIII Augusta) was stationed after participating in the suppression of a Thracian uprising. In 69 AD, it was replaced by the First Italian Legion (Legio I Italica), which was headquartered there for the next almost 4 centuries, at least until the 430s AD, and was a major force in the defense of the so called Lower Danube limes (frontier) against barbarian invasions together with other Roman strongholds such as Sexaginta Prista (today’s Ruse), Durostorum (today’s Silistra), and Ratiaria (today’s Archar). A testimony to the importance of Novae was that it was visited by three Roman Emperors: Trajan (r. 98-117 AD), Hadrian (r. 117-138 AD), and Caracalla (r. 198-217 AD). The most prosperous times for Novae was during the Severan Dynasty (r. 193-235 AD). In 250 AD, about 70,000 Goths led by Gothic chieftain Cniva invaded the Roman Empire by crossing the Danube at Novae; regardless of the siege, however, the fortress of Novea did not fall into the hands of the Goths. With the continuing Goth invasions and settlement in the Balkan provinces of the Roman Empire and East Roman (Byzantine) Empire in the 4th and the 5th century AD, in 418-451 AD Novae became the residence of Ostrogoth Chieftain Theodoric Strabo who was a rival of his kinsman, Theodoric the Great, King of the Germanic Ostrogoths (r. 475-526 AD). The last traces of major construction at Novae date to the rule of Byzantine Emperor Justinian I the Great (r. 527-565 AD). At the end of the 6th and the early 7th century Novae was attacked by the Avars and the Slavs which led the Ancient Roman and Byzantine city to decline. In the late 5th and 6th centuries Novae was the center of a bishopric. Novae was last mentioned as a city in written sources in the 7th century AD. In 2014, the local authorities in Svishtov unveiled the partial restoration of the ruins of Novae with almost BGN 6 million (app. EUR 3.1 million) of EU funding.